Trying to find the right career test for you? Don’t know where to start? We know there are so many choices out there, with a lot of different information! Aptitudes, abilities, personality, interests – which one do you choose? 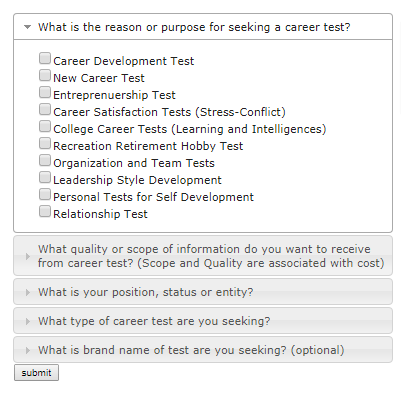 TestEts has a FREE career test quiz that you can take today to help you make the right decision. This quiz leads you to the career test that will tell you exactly what you want to know! No more guessing about which test is right for you. No paying for something you didn’t need! This free quiz finds out which test will give you the answers you need and lead you straight to a hyperlink so you can get started today. Don’t drown in the sea of career test information! Find the exact test you need with this free quiz! Find the right test quickly and easily – click the link to take the quiz!